I wish I could remember the model of my first camera. I had a little plastic point and shoot Olympus back in middle school and high school but I didn't really think about photography too much then. Odds are I probably just used a disposable camera most of the time anyway. So this was pre-digital revolution and Mr. Cruz made us shoot slide film, Kodachrome probably. I didn't appreciate this at the time, at least not as much as I would now, but I should say thanks to him. Though now I'd also probably be a bit bothered by having to pay for film. Ha. Whatever though, great class. Thanks, Tom Cruz, wherever you are. Later that summer my dad bought me my first SLR camera. 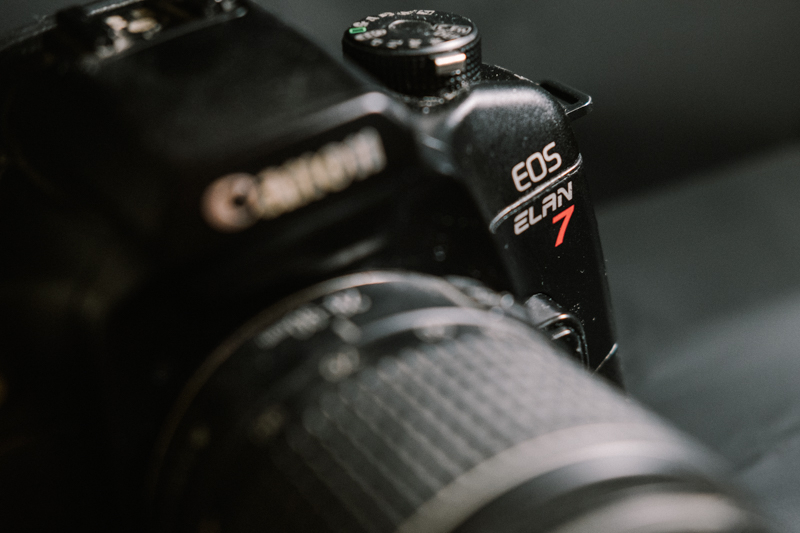 The Canon Elan 7. Kit lens and all. :) I'm proud to say I still own that camera. Do I use it? Nope. But at least I still own it. So, with my new camera in hand, I returned to college with a passion. I would take it everywhere with me. Shot all around campus and Malibu coastlines with it, got my film developed and printed at the local Ralphs. Haha. Oh man. I used to post these pictures on websites that I can no longer remember. Man, what was that sort of emo website that people posted on? Not the livejournal one, but the one that artists liked? This is back in 2001/2002. Pre-MySpace. Dang, I wonder if my account still exists. Anyway, this Canon Elan 7 was a great camera for me. I don't know anything about the specs. Did people even really care about specs back then in those pre-digital days. What did we care about then? Flash sync speeds? Goodness, I don't even know. I know I didn't really care about the specs. Those were some stress free days. Let's see...the camera had autofocus. I thought that was pretty cool. I think it also allowed for double exposure. Maybe, I don't know. I think so though. Can't say I really remember actually. Whatever, it was my camera and I loved it and I took it all over the place. Anyway, the reason I bring this all up is because over the last 18 years, I've found myself going through a lot of cameras/gear/tools, whatever you want to call it. And honestly, yeah, we all like to play with the new toys, but once the "newness" wears off, I'm still the same photographer taking pictures of my feet (not really my feet), but you get the point. I'll continue this little series in the next few posts going through the gear I've enjoyed over the years.